Stunning in appearance, these classic violet pet urns are handcrafted in brass, electroplated and beautifully finished in a rich violet color. For more detail, a polished pewter band has been placed near the lid. This urn is pictured at the 2nd in from right of the photo. You may further personalize this urn with the option of adding your pet's engraved name, dates, sentiments or selected artwork. Additional charges will apply. Available in four sizes, we are able to accommodate any size pet. 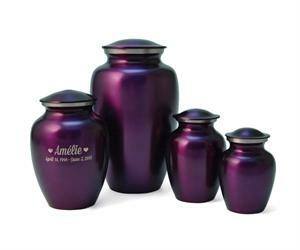 Would You Like Your Urn Engraved? How would you like your engraving to read? Would you like to add a second row of engraving? How would you like your second row of engraving to read? Would you like to add a symbol to your engraving? Which symbol would you like to add?